You may have seen it on TV or in person at your favorite club. Now, learn the art of salsa dancing at Arthur Murray Dance Studio of Narberth & Paoli, PA. A popular form of social dance, the salsa is a fun, lively style comprised of fast steps and turns, sensuous hip motions and upper-body movements. No matter your skill level or specific goals, our well-trained instructors will offer positive instruction, so you can learn the basic steps and techniques of this incredibly energetic style of dance in an inviting environment. Although the salsa is said to have originated in the United States, it has deep roots in and draws inspiration from Latin American regions, such as Cuba and Puerto Rico. 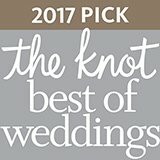 As its name implies, the salsa is a partner dance that emphasizes a certain degree of spice, sensuality and freedom of movement but combines them with strict, precise techniques to create an exciting mix of improvisation and formality. 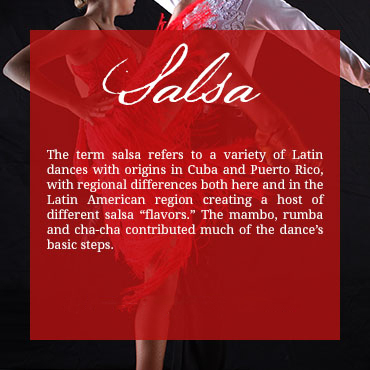 When you think of salsa, you probably picture the vibrantly colored costumes and excitingly quick steps and turns. Although the salsa is a fun, high-energy social dance, it requires focus, determination and proper instruction. Whether you’re a seasoned dancer or a beginner looking to learn some pointers before heading to the club, our instructors will teach you and build on basic techniques to enhance your knowledge and precision out on the dance floor. If you’re a new student, our studio offers a discount on your introductory class to help you get a feel for our teaching methods. As you learn valuable skills and improve your form, your instructor will tailor a program suited to your needs and desires. Utilizing the three-way approach, our highly trained instructors help you sharpen basic techniques while offering diverse learning environments to encourage self-confidence. Between private lessons, class instruction and practice sessions (dance parties), you’ll learn how to express yourself in an electrifying atmosphere. There’s no better time than now to learn how to salsa dance. Whether you’re looking to prepare your wedding party for the big day or you plan on showing off your moves at a social event, the instructors at Arthur Murray Dance Studio of Narberth & Paoli, PA are eager to teach you this Latin-inspired dance. Contact our Narberth or Paoli studio, and get ready for your big night out.